Alzheimer Treatment: In a recent article written by Bills Gates, the world’s richest man, he talks about the dangers presented by Alzheimer’s disease and how a growing number of elderly people, including close family members, are getting the disease which affects the quality of life of both the patient and his/her family. Another interesting fact that the founder of Microsoft pointed out was the prevalence of this disease among the black populace and he then pledged to support the fight against this disease with $50 million. For those who have been following the works of Bill gates closely, you will know that the man likes putting his money where his mouth is when it comes to supporting global health causes. And his commitment to putting such an amount of money in efforts to find a way of effectively tackling Alzheimer’s disease just goes to show how much of a problem that the disease is causing to mankind. Basically, Alzheimer’s disease is one of the leading neurological diseases that is caused by the slow and steady death of brain cells which results in memory loss and cognitive disabilities. This disease is highly prevalent among the elderly and is ranked as the most common type of dementia in the world. As people continue to live longer due to the improved level of healthcare delivery, the world is now having a larger population of aged people more than in any other time in history and this creates a problem of even more patients with Alzheimer’s disease with those around them also suffering the effects. The disease occurs in gradual steps, from a preclinical stage with no symptoms, to mild cognitive impairments and then advanced dementia. • Loss of memory: One of the first signs of the disease is an apparent loss of memory as the sufferers begin to forget things quickly, from names of people to faces and other common things, this gradual memory loss continues to increase as the condition deteriorates. • Speaking and visual impairments: People with the disease will begin having an inability to recognize faces and common objects, the speech will become incoherent with frequent errors in pronouncing words. • Character changes: People suffering from Alzheimer’s disease will start behaving out of character by becoming less interested in things happening around them and trying to behave out of character with some socially unacceptable behaviours. This disease is associated with a shrink in the brain size due to the death of brain cells which affects the overall brain mass. But what actually instigates this death of brain cells is still unknown as scientists can only link it to certain risk factors such as genetics, brain injuries, etc. • Drugs: Available drugs can help improve the quality of life of patients by suppressing symptoms, common prescriptions include alantamine, tacrine and donepezil. • Herbal therapy: This Alzheimer treatment option is offering better results due to the fact that Alzheimer’s disease does not affect the immune system but can be controlled by the anti-inflammatory factors in herbal extracts. 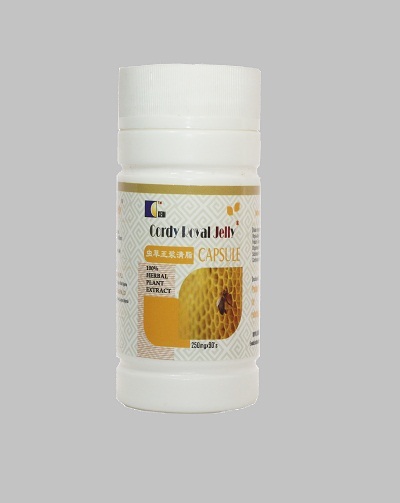 You can order for Cordy Royal Jelly to treat Alzheimer’s disease. We sell member price to encourage patronage and membership after you have result that our food medicines/supplements works. The price for Cordy Royal Jelly is N10,000 excluding cost of delivery. We offer prompt delivery of the product using courier services for between N500 and N2,500 nationwide.